Despite being overshadowed by Jihadists and right-wing political violence, insurrectionary anarchist activities have been and continue to be on the rise throughout Europe. Far from the spotlight, insurrectionary anarchist cells across Europe have started the year 2018 in quite a lively manner. This is consistent with an overall increase in insurrectionary anarchist activities throughout the Old Continent over the recent years. Yet, while law enforcement agencies have been quite prolific in dismantling cells and apprehending violent anarchists, analysts and scholars appear to lag behind. Nonetheless, insurrectionary anarchism still represents a serious, dangerous threat to Europe and is likely to continue to do so in the near-future. Contemporary insurrectionary anarchists: who are they and what do they want? Attempting to provide a definition of anarchism that is inclusive of all its – sometimes quite radically – different trends and aspects is by all means a daunting task. As an anarchist eloquently puts it, “to call yourself an anarchist is to invite identification with an unpredictable array of associations, an ensemble which is unlikely to mean the same thing to any two people, including any two anarchists.” If that is true with respect to classical anarchism, the same can be said about contemporary anarchism. In any case, providing a comprehensive definition of (contemporary) anarchism is beyond the scope of this article, the focus of which is rather on a specific segment of the contemporary anarchist movement, namely insurrectionary anarchism. Contemporary insurrectionary anarchism is an extremist ideology that justifies resorting to illegal and violent action in order to hasten revolutionary insurrections. Needless to say, this idea is closely associated with the concept of ‘propaganda of the deeds’ – an idea theorized by anarchist Pierre Brousse in 1877 that characterizes classical anarchism first and was later adopted by terrorist organizations of different ideological natures. In a nutshell, it posits that acts of political violence carried out by underground organizations can be used to educate the masses and pave the way to the revolution. As such, insurrectionary anarchists are extremely critical of any anarchist movement that does not take direct action. Similarly, they reject any idea of struggle that is issue-based or that involves establishing formal organizations or revolutionary vanguardism – features that would imply authoritarian and/or bureaucratic mechanism within the revolutionary movements. Among the works that have mostly influenced contemporary insurrectionary anarchism is La Gioia Armata (The Armed Joy), a book published in 1977 by Italian anarchist Alfredo M. Bonanno. Likewise, it is on the Italian Peninsula that contemporary insurrectionary anarchism has found renewed momentum over the last two decades. A turning point was the emergence of the Federazione Anarchici Informale (FAI – Informal Anarchic Federation) in 2003. FAI is better described as a loose network, a “chaotic and horizontal organisation (sic), without bosses, authorities or central committees taking decision.” The long-term goal of FAI is a society free from capital and the State, a society “where exploitation of men over men and of men over nature does not exist”. The revolutionary activity is thus aimed at hastening the breakdown of Western, capitalist society as we know it. Along this ultimate goal, solidarity with comrade revolutionaries, especially those detained in prisons, is a further key-narrative among anarchists. Statements, cells’ denomination, and attacks are often dedicated to fellow incarcerated comrades. Furthermore, the refugee-crisis, the socio-economic crisis, environmental issues, and activities of the right-wing extremists have represented additional drivers of anarchist endeavors. Far from being a one-hit wonder in the populous anarchic cosmos, FAI expanded to soon include more groups and cells than the original four. International ties with the Greek anarchic organization Conspiracy of the Fire Nuclei (CNF) were first suspected and then proved, respectively in 2010 and in 2012, after the Italian police arrested several members of FAI. As part of its international efforts, FAI encouraged the formation of the Fronte Rivoluzionario Internazionale (FRI – International Revolutionary Front) in 2011. Under the aegis of the Informal Anarchist Federation / International Revolutionary Front (FAI – FRI), anarchists cells and organizations have carried out dozens of attacks over the last years in countries like Greece, Italy, UK, and Spain but also overseas, in Chile and Mexico, for example. It is no surprise if the activities of insurrectionary anarchists rarely make it to the front page. Obscured in the mainstream media by the more spectacular Jihadist attacks, it is even questionable whether the larger European audiences even take notice of anarchist activities at all. If anarchists fail to catch the attention of the public, even more so can be said with respect to analysts and scholars. Insurrectionary anarchism is, indeed, an under-researched phenomenon, one that is currently overshadowed not only by Jihadism but also by right-wing extremism. A few words on anarchist modus operandi are necessary in order to clarify this lack of attention. Traditionally, anarchist terrorists’ trademarks have been mainly improvised explosive devices (IED) and improvised incendiary devices (IID). In addition, sabotage and shooting represent less frequent courses of action. With respect to the targets, anarchist selection is much more diverse so as to include governments, diplomats, law enforcement agencies, businesses, media agencies and private citizens. These observations refer to the time frame from 2003 (FAI’s establishment) to 2016 (last available year on START Global Terrorism Database). Previous anarchist patterns do not, however, really differ from the current. Yet, despite this plurality of targets and weapon types, anarchist terrorism usually features low-intense attacks and, thus, rarely results in casualties or major property damages. Even when carrying out targeted operations, anarchists may well refrain from killing the victim. This is the case, for example, of Roberto Adinolfi, senior executive of Ansaldo Nucleare kneecapped in Genoa in 2012 by members of the FAI. While undoubtedly a fortunate feature, the low-intensity characteristic of anarchist attacks has deprived insurrectionary anarchists of media attention and, to a lesser extent, of analysts’ and scholarly interest in anarchist terrorist activities. Nevertheless, there are some interesting developments occurring within the realm of insurrectionary anarchism that deserve further attention. To begin with, anarchist subversive activities in Europe are on the rise again. Such activities had already experienced a remarkable increase towards the end of the last decade, reaching their peak in 2010 when 45 attacks were successfully carried out. Targeted countries included Greece, Italy, Spain (these are traditionally the countries most affected by insurrectionary anarchism in Europe), as well as Austria and Germany. 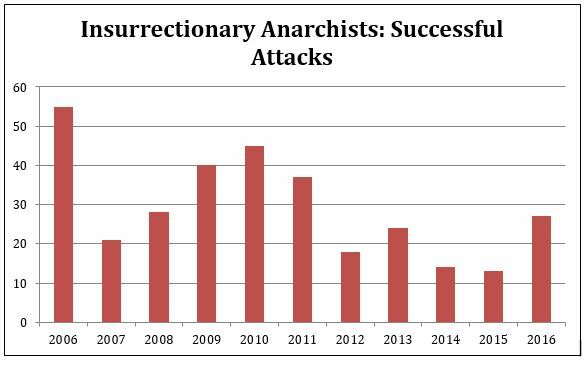 Thereafter, as a result of the apprehension of several anarchists, the number of attacks dropped consistently (excluding a brief resurgence in 2013), reaching a minimum of 13 in 2014. From then on, attacks have occurred once more on a more frequent basis in 2015 and 2016. These trends are easily observable in Europol’s Terrorist Situation & Trends Reports of the last ten years. Although no report or database is yet available for 2017, the impression is that the positive trend might have been confirmed again. A careful review of the SITE Intelligence Group section ‘Far Right/Far Left Threat’ reveals, indeed, that anarchist cells have claimed dozens of low-intensity attacks in Greece, Germany and Italy. Likewise, the year 2018 has started in quite a lively manner, as insurrectionary anarchists have carried out multiple attacks across the above-mentioned countries. Also, this latest comeback of insurrectionary anarchism is taking place at the same time as is a surge of right-wing extremist political parties and street movements. Not surprisingly, anarchists have carried out attacks against those right-wing political actors. A further interesting development concerns anarchists’ narrative and motivation. This is a development that is currently observable in insurrectionary anarchists’ ongoing activities throughout Europe, more specifically those which occurred in the first quarter of 2018. Starting from January 20, European anarchists have carried out attacks in solidarity with the Kurdish Democratic Union Party (PYD), and its armed wing YPG, against the Turkish military operation “Olive Branch,” thereby answering a “call” of an anarchist comrade in Afrin. Moreover, after an initial sequence of attacks throughout Europe, an anarchist blog published a list of targets on March 23. This list includes European arms companies that are tied to the military operations in Afrin. Other desirable targets are identified with Turkish diplomatic institutions as well as “Turkish fascist ideological institutions” such as the Türkisch-Islamische Union der Anstalt für Religion (DITIB – Turkish-Islamic Union for Religious Affairs), which has already been struck by German anarchists on multiple occasions. Overall, the embracing of the PYD-YPG cause – i.e. the establishment of a Kurdish Federation in Northern Syria, a goal that itself is theoretically not quite in line with anarchists’ worldview – raises some relevant questions with respect to the current and future trajectories of insurrectionary anarchism: is this involvement spontaneous solidarity or an attempt to widen the narrative and ideological spectrum so as to avoid another “retreat” after the one experienced towards the beginning of the decade? Will this involvement result in an increase in appeal and, consequently, in recruits and subversive operations? Will anarchists possibly become a new vanguard of the left-wing militant activism? If so, will there be a considerable qualitative and/or quantitative leap in such operations or will these persist in being low-key? It is extremely difficult to answer these questions. As analysts, surely we should allow mere speculations to give way to more factual and accurate inquiries. Yet, the above-mentioned inherent diversity of anarchist organizations and cells, the anti-hierarchical nature of anarchic extremism and the related difficulties in obtaining clear-cut evidence make it extremely challenging to feasibly and reliably assess the emergence of a widespread, coherent, and long-term course of action among insurrectionary anarchists in Europe. Most likely, further developments in the near-future will help to unravel this conundrum. It is worth spending a few words on the complicated relationship between technology and anarchists. If, indeed, on the one hand anarchists rely largely on and benefit from technologies (such as the Internet, computers and smartphones) they are also increasingly critical of a number of emerging technologies. Anarchists have, among others, clearly expressed their antagonism to technologies such as facial recognition systems, robotics, synthetic biology and nanotechnologies. Regarded as further instruments at the “master’s” disposal, anarchists believe, in short, that they reiterate the exploitation and suppression of the masses as well as contribute to the destruction and pollution of the planet. To the best of one’s knowledge, it is unclear whether insurrectionary anarchists have started to carry out sabotages and/or attacks against symbolic targets related to such technologies. However, we are on the verge of the Fourth Industrial Revolution with technologies like additive manufacturing (or 3D printing) that are likely to revolutionize the means and relationships of production. It is, hence, reasonable to believe that this stance of anarchists could exacerbate in time, potentially leading to a more aggressive behavior, if not a sustained violent campaign, against such technologies – along the same lines of the Red Brigade’s campaign against computer technologies in the 1980s. While insurrectionary anarchists might prove tough to eradicate entirely, continuing dismantling anarchist cells, monitoring as well as hindering anarchist activities on the Internet, and acquiring a deeper understanding of contemporary insurrectionary anarchism should definitely contribute to keeping the threat as low as possible.